The teddy bear perched above the rack has a little story of its own. 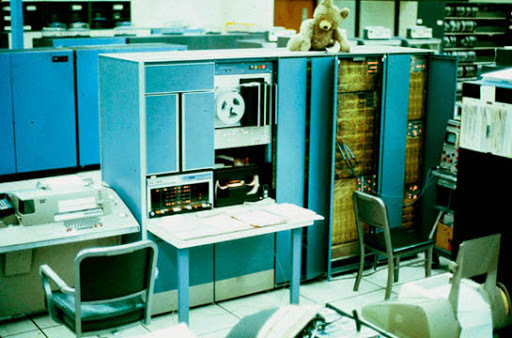 DEC at that time was emphasizing how cute their products were (relative to IBM mainframes) in an ad campaign featuring a toy stuffed bear. So, we placed an order for one Ursus Theodorus, part number and price to be determined. The local DEC office thought this was pretty funny, so they forwarded a formal purchase order for one stuffed bear as per advertised to Maynard. Well, the rest is history and the bear in the photo has a DEC part number and identification tag. The above photograph was taken on the 2nd floor of the University of Michigan's Computing Center Building on North Campus in Ann Arbor, c. 1971. Ursus Theodorus is currently living with Mike and Suzan Alexander in Ann Arbor. Follow this link for more photos: https://picasaweb.google.com/103267580193222253134/6290149857483480337.